This week we are talking with Liz Spain, creator of steampunk game, Incredible Expeditions: Quest for Atlantis, where players lead a steampunk expedition to explore fantastic places and face otherworldly horrors in a deck building strategy game for 1-5 players. Airship Ambassador: Hi Liz, it’s great to catch up with you and talk about your projects. Liz Spain: Hi! I’m really excited that we’re so close to revealing the final product of the project I’ve been working on for the past two years. AA: Before we talk about your current game, which is definitely not your first, what can you share about your background as a games designer? LS: I started in game design creating Lovecraft-inspired live-action mystery games. My husband and I ran these modules in our hometown and at Gen Con (the largest tabletop gaming convention in North America). 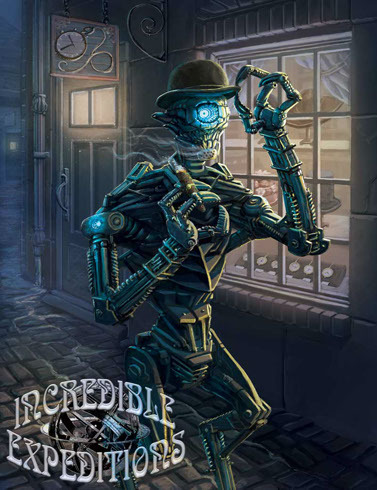 Eventually, we added steampunk elements to our games which enriched the worlds of our games and gave everyone an excuse to costume to the nines. I worked a lot on Marshal Hunter’s steampunk live-action roleplaying game Rise of Aester. In addition to writing world material and helping to develop the rules, I also wrote the original modules for the game. Several of the characters I wrote for those modules became very popular and their stories became part of the world’s canon. I’ve also playtested, costumed, modeled and demoed for a number of Flying Frog Productions board games. The Something Wicked expansion for A Touch of Evil is the first game I worked on there, but you can find my name in the credits for a number of Flying Frog games. 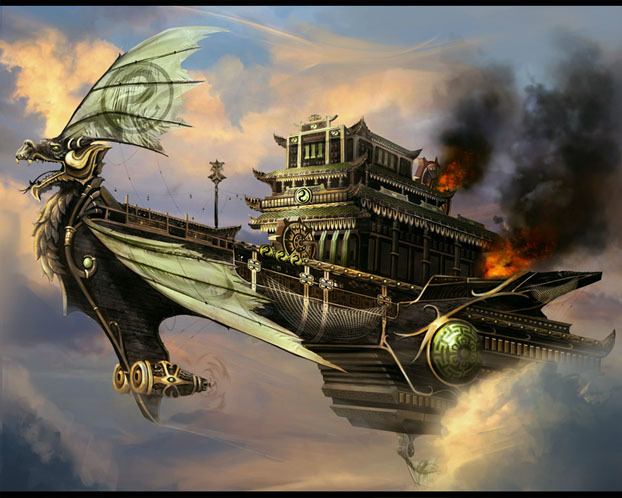 I’ve also did consulting on the steampunk aesthetic and costumed over 100 people for Harebrained Scheme’s Crimson Steam Pirates on the ipad. AA: Wow, all of those games sound interesting, and it’s great to hear about the various roles you’ve played in creating and bringing those games to life. For your current game, what is the premise of Incredible Expeditions? LS: A slightly-unhinged scientist, Professor Pendergast, was kicked out of the Royal Academy of Sciences for his wild theories on the fate of the lost city of Atlantis. After discovering that the sunken city drifted and became trapped in the ice shelves off the coast of Antarctica, he announced to the world that he was forming an expedition. Other notable explorers the world over jump in on the challenge and the race is on to be the first to uncover the ancient city. AA: What was the motivation for creating Incredible Expeditions? How did it all come about? LS: Incredible Expeditions is my attempt to put the world of my Lovecraftian steampunk mystery games in a box. I really wanted to see the creative imagination of steampunk in a board game and decided the only way that was going to happen was if I did it myself. AA: Completely understandable, and sometimes the only way to get something done, or to get just the item we want, is to do it ourselves. Why a card game? LS: I wanted a game that would be easy for anyone to learn to play and would be dripping with a steampunk aesthetic and world. AA: Why use steampunk as the game’s aesthetic? LS: Incredible Expeditions is more than just a board game. I designed it to showcase the imagination and creative maker skills of the steampunk community at large. By starting with a steampunk aesthetic, I’ve been able to bring in friends to contribute to the project who are illustrators, prop makers, costumers, musicians and even a dancer and a calligrapher. AA: That’s an interesting range of skills to bring into creating a game. Who are the other people who are part of the team to create this game? LS: The biggest contributor to the project has been my husband, Austin. Throughout this project, he’s been there as a strong voice of criticism and helped immensely with organizing the Kickstarter campaign and playtesting. 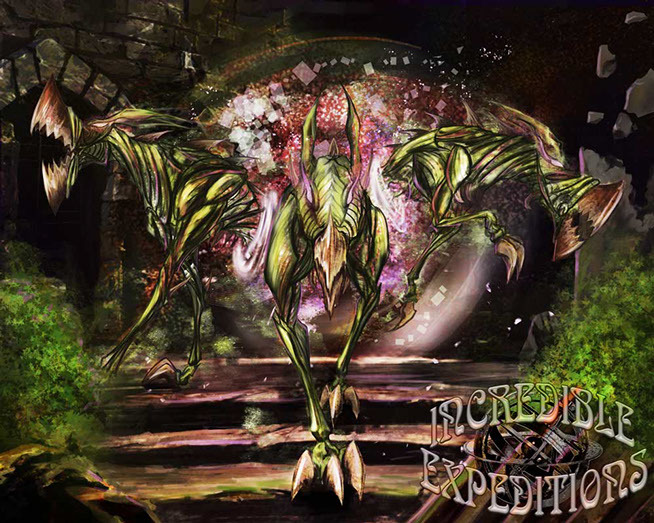 Incredible Expeditions owes the depth and balance of its strategy to his constructive skepticism at every step in development. Jade Cheung (of Arctic Phoenix Studios) is a friend and artist who helped me develop the distinctive art nouveau style for the graphic design. The card frames are her design and she also made costumes and modeled for different characters in the game. Beyond that, there are simply too many wonderful people to name. Over a dozen artists worked on the illustration and graphic design and there were dozens of models, most of whom made their own costumes and props. There’s hardly a steampunk in the Seattle area who hasn’t contributed to the project in some way. Welcome back for the second part of our chat with Liz Spain, talking about her newest game, Incredible Expeditions: Quest for Atlantis. AA: What kind of back story is there for Incredible Expeditions which didn’t make it into the final version? LS: There’s a whole world of story behind the characters, places and events in the game. Every time the game is played, the elements come together a bit differently and people create their own stories. But I’m sure savvy players will see the connections, which are hinted at in the bits of fiction and the illustrations, but I don’t want to spoil it for anyone. AA: What kind of research went into creating the Incredible Expeditions world? 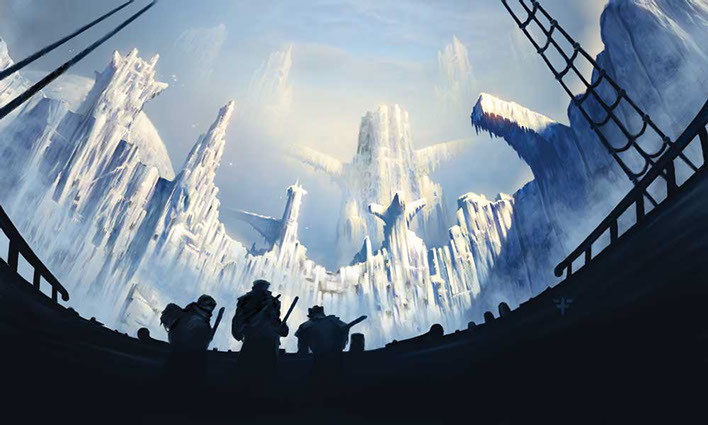 LS: As major inspirations for the theme and world of Incredible Expeditions, I poured over the characters, worlds and events of 20,000 Leagues Under the Sea and At the Mountains of Madness. I also wanted to capture the excitement and dramatic stories of actual 19th Century expeditions to places like the North Pole. For example, the luxurious greenhouse icebreaker ship in the game was inspired by the ship constructed for the 1893 Fram expedition to the North Pole, which was outfitted with an elegant library complete with padded lounge chairs. AA: Are there any great artwork pieces which were considered but didn’t make it into this project? 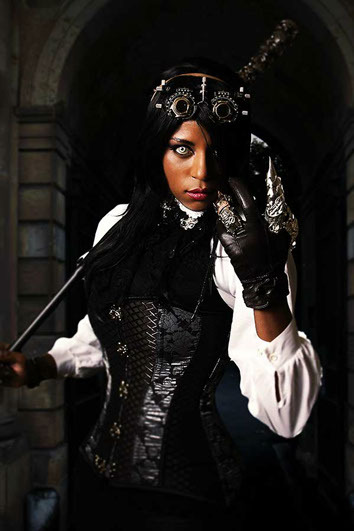 LS: There are a lot of fantastic portraits of steampunks that we simply didn’t have room for. I’m hoping some of them will make their appearance in future games. There are also several artists I wanted to include in the project that just didn’t have room in their schedule. AA: What makes game play engagement different in this games compared to others? LS: Generally speaking, games with deep strategy don’t put much emphasis on a having beautiful aesthetics or rich world. Incredible Expeditions bridges the gap between games that create a rich narrative and those that are intellectually challenging. AA: Are there any plans for expansions? LS: There’s already two small expansions for the game which we were able to produce through Kickstarter stretch goals. One is entirely Lovecraftian-themed and the other features elements from Arabian Nights’ stories. If the game sells well, I plan to create sequels which explore complementary themes, like time travel. AA: What were some of the triumphs and tribulations in the whole process? LS: Finishing the Kickstarter campaign with over $60k in funding was the first great triumph, manufacturing the game is another. I hope to count another triumph when we sell through the first print run of the game. The biggest tribulation so far has been delays caused by neurological complications of my autoimmune disease. Pre-production was stalled for several months because I couldn’t read a computer screen for more than a few minutes at a time. With careful management and a gigantic new monitor, I was able to get the project back in gear and finish the final version of the game. Being at the helm of such a large, long-term project (over two years now) has brought me a new understanding of how essential it is that I keep my health in check. AA: How was the whole Kickstarter experience? Was it a mental and emotional rollercoaster? LS: Running a Kickstarter campaign was an amazing amount of work, but absolutely worth every moment spent. In addition to a year of work on the project in general, I dedicated a full month to preparation before launching our campaign. As soon as the campaign began, we discovered there were still important things we’d missed, like a gameplay video and a print-and-play version of the game. While the money raised enabled us to manufacture Incredible Expeditions much sooner and at better quality, it was really the enthusiasm of our backers that convinced me the game needed to be made. AA: You’ve run several game sessions for design and beta testing. What are some memorable fan reactions to Incredible Expeditions which you’ve heard? LS: There’s a lot of different aspects to the game that people tend to like the best. Some like the artwork and theme, some like the tough decisions that have to be made, and some like how flexible the game system is. But as a game designer, my favorite praise has come from other game designers and game experts. When someone who plays a lot of board games tells me they keep thinking about the game and can’t wait to play again, I know I’m on the right track. AA: That is quite an achievement! When I get my family and friends to play Incredible Expeditions, what do they need to know? LS: The role of an expedition leader isn’t an easy one, and the journey will be difficult. Be prepared to rethink your strategy when new situations arise. We’ll take a break here in our chat with Liz Spain, talking about her newest game, Incredible Expeditions: Quest for Atlantis. Check back for the conclusion where Liz talks game play and the creative process. Welcome back for the conclusion of our chat with Liz Spain, talking about her newest game, Incredible Expeditions: Quest for Atlantis. Airship Ambassador: After all these teasing questions, what is the actual game play? AA: For the aspiring game creator, what lessons did you and your team learn along the way? LS: Beware hubris. Never be afraid to ask someone’s opinion, test your game as much as is feasible and seek the advice of those who have tread this path before. 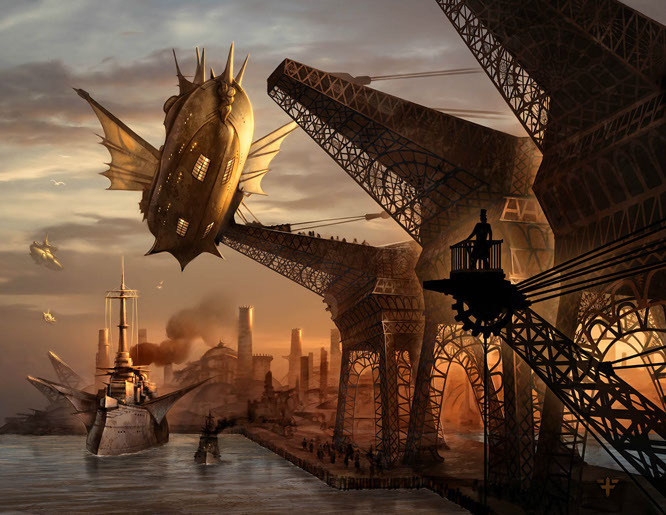 AA: If you weren’t creating steampunk games, what else would you be doing now? LS: I’d still be running my own small steampunk clothing company and working freelance as a costume designer and stylist. Just before I began the Incredible Expeditions project, I did costuming for a film project for the first time (previously, I’d only done work for stage and photography). It was a lot of fun and I’d eventually like to do more of that. AA: What do you do to keep a balance between game creation, other work projects, and the rest of your life? LS: I don’t. Game design and publication takes up most of my waking hours, though I make sure I dedicate some time to other things each week, like volunteering and outdoor activities. My garden has been woefully neglected for a while now. AA: Do you get to talk much with other creators to compare notes, have constructive critique reviews, and brainstorm new ideas? LS: Absolutely. The best thing about living in Seattle is being constantly surrounded by creative people of every stripe, and especially other game designers. LS: The Pacific Northwest, and Seattle in particular, is a goldmine of geekery. A number of the largest companies in hobby gaming are located here. There’s a lot of other game designers to work with, an endless supply of people interested in play testing, and a lot of local game stores who are eager to support local game designers. AA: Looking beyond steampunk and gaming, what other interests fill your time? LS: The Seattle Humane Society has an amazing behavior program that I volunteer for, helping to teach dogs new behaviors so they can become better pets. I also train my own dog to do nose work, and we do demonstrations at educational events for kids. In the winter I love to snowboard and in the spring and fall I hunt for culinary mushrooms like morels and chanterelles. My backyard is home to a small flock of chickens and a garden for herbs, fruits and vegetables. There’s something immensely satisfying about growing your own food, and I enjoy exploring new ways to cook, bake and preserve those ingredients. LS: I got into costuming professionally starting as a cosplayer over a decade ago. I still keep tabs on the new anime and manga that come out. Though I haven’t competed in years, I also still like to yo-yo every once in a while. AA: How do those interests influence your work? LS: As a creative person, the value of exploring the myths of other cultures cannot be underestimated. When stories are your medium, a broad palette comes from a wealth of influence. Also, I put a lot of value into aesthetic experience and challenge. Humans are tool-users and problem-solvers. A game that is pleasant to touch and makes you think is one that you’ll come back to again. AA: Three quick fire, random questions – what is your favorite piece of jewelry, appetizer, and landmark? LS: My automatic winding skeleton watch, bruschetta on garlic herb bread made with garden tomatoes, and The House on the Rock is a plethora of wonderful, random weirdness. Thanks, Liz! It was really great to have this time to catch up and hear about your game. Thanks to all of the readers who followed along – keep up to date with the game and its progression, Incredible Expeditions: Quest for Atlantis.